Residents are reminded Falkirk Council’s bulky uplift service will now have a £30 charge per uplift – for up to five items – and will now accept a wider range of materials, including kitchens and bathrooms fittings. Brown bin collections will now be four weekly until November 2019, when it reverts to an on demand service between December and February. Additional brown bin collections incur a charge of £25 per year. As reported in the Falkirk Herald earlier this month, recycling Centres will see their operating hours changed with Kinneil Kerse open Monday, Tuesday, Saturday and Sunday 8am to 6pm; Wednesday 8am to 8pm and will be closed on Thursday and Friday. Roughmute, meanwhile, will be open Monday, Thursday, Saturday and Sunday 8am to 6pm; Friday 8am to 8pm and will be closed on Tuesday and Wednesday. Owners of commercial type vehicles as their only means of transport will need to register for a permit, to use the recycling centres for their household waste – not trade/commercial waste. There is no charge for these permits, which are available from the recycling centres, but there is a restriction of ten visits per year in place for any household with a van. 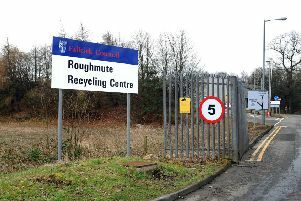 Councillor Paul Garner, environment spokesman, said: “There will always be at least one recycling centre open every day of the week, and both will be open over weekends. We have also ensured there is late night opening till 8pm at least one night a week for both centres. Visit www.falkirk.gov.uk/binday for more information or download a bin calendar to your smartphone to set a reminder.